CPT is Like an EKG for an Engine. The tool is designed to compare an engine’s individual cylinder contribution to overall power, i.e. how ‘smoothly’ an engine is running (by counting cylinder misfires). In the absence of any additional diagnostic information i.e. check engine light, etc. the easy to use scoring system can provide a technical basis for utilizing reasonable care before recommending Fuel System Cleaning (FSC) or other engine tune related services to consumers. What is the business case for CPT? It provides a consistent opportunity to increase consumer awareness of the state of their engine tune. It provides technicians and service advisors the confidence to recommend appropriate services only if there is an appropriate basis for doing so. A large statistical database has shown that there is actually NO basis for recommending engine tune related services to about 33% of consumer vehicles. It utilizes a testing based recommendation system that enhances consumer protection policies. Reputable companies are increasingly nervous about a regulatory response to mileage-based recommendation from Fuel System Cleaning companies. Testing before recommending services removes the guesswork that many service advisors currently use to provide Fuel System Cleaning Recommendations. 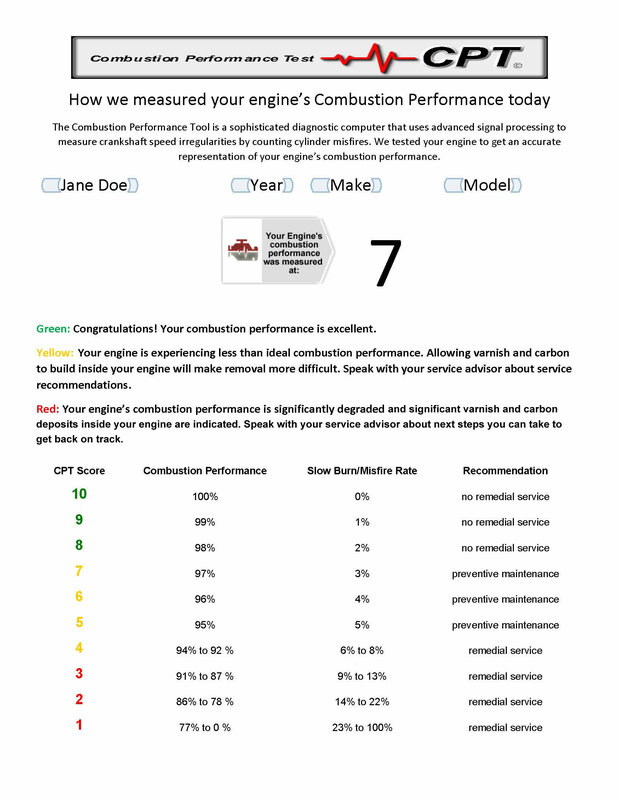 A printable report provides a description of what the CPT Scores mean and how they are correlated with slow burn misfires and engine combustion performance. The tool is designed to compare an engine’s individual cylinder contribution to overall power, i.e. how ‘smoothly’ an engine is running (by counting cylinder misfires). In the absence of any additional diagnostic information i.e. check engine light, etc. the easy to use scoring system can provide a technical basis for utilizing reasonable care before recommending Fuel System Cleaning (FSC) or other engine tune related services to consumers.